This Post was originally published in La Jornada. The 50th anniversary of the violent death of U.S. president, John F. Kennedy has yielded a long kept secret: in the aftermath of the assassination in Dallas, Fidel Castro sent a back-channel message to Washington that he wanted to meet with the official commission investigating Kennedy’s murder, to dispel the swirling allegations that Cuba was responsible. The Commission, headed by Chief Justice of the U.S. Supreme Court, Earl Warren, sent a young African-American staff lawyer, William Coleman, on a clandestine mission to rendezvous with the Cuban leader on a boat in the Caribbean. In the United States, the anniversary of the young president’s death has generated massive media coverage—special television documentaries; a slew of new books and articles, a new Hollywood movie. Inevitably, the many conspiracy theories as to who killed Kennedy and why are once again being debated. The Warren Commission concluded that Oswald, a deranged loner and self-declared Marxist, acted alone when he shot the president. But U.S. government secrecy, particularly the fact that the CIA withheld information on its Top Secret efforts to kill Castro, and on its surveillance of Oswald when he visited Mexico City—protecting its extensive intelligence gathering operations in Mexico—fueled suspicions of a cover up. Nor did the White House share the extraordinary details of significant developments in Kennedy’s attitude toward Cuba—a country central to any historical discussion of the president’s shocking murder in Dallas fifty years ago. Almost immediately following the assassination on November 22, 1963, enemies of the Cuban revolution began planting accusations that the pro-Castro Oswald had conspired with Cuba to kill the president. In New Orleans, where Oswald had created a one-man “Fair Play for Cuba” committee, a CIA-backed exile group, the Revolutionary Student Directorate (DRE), published its newsletter on November 23 with a picture of Castro next to a picture of Oswald. Six days after the assassination, CIA director John McCone reported to the new president, Lyndon Johnson, that a Nicaraguan intelligence agent in Mexico City named Gilberto Alvarado had “advised our [Mexico] station in great detail on his alleged knowledge that he actually saw Oswald given $6500 in the Cuban Embassy in Mexico City on September 18th.” Alvarado claimed the money was payment to kill the president. Castro himself saw a very different conspiracy at work. 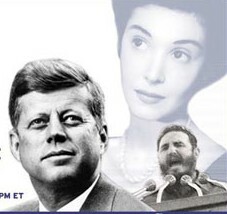 On November 23rd he broadcast a statement on Cuban radio in which he labeled the Kennedy assassination “a Machiavellian plot against our country” to justify “immediately an aggressive policy against Cuba…built on the still warm blood and unburied body of their tragically assassinated President.” Oswald, he stated, may have been “an instrument of the most reactionary sectors that have been planning a sinister plot, who may have planned the assassination of Kennedy because of disagreement with his international policy. The talks between Cuba and the U.S. began, ironically, around Washington’s bald act of aggression—the paramilitary invasion at Playa Giron. In the aftermath of Cuba’s victory over the CIA-backed brigade, the President and his brother, Robert Kennedy sent a lawyer named James Donovan to negotiate the release of over 1000 captured brigade members. During the course of several negotiating sessions in the fall of 1962, Donovan brokered a deal to supply Cuba with $62 million in food and medicine in return for the release of the prisoners. He not only won their freedom but the trust of Fidel Castro as well. In the spring of 1963, Donovan returned to Havana several times to negotiate with Castro the release of two dozen Americans—three of them were CIA operatives– imprisoned in Cuban jails on charges of spying and sabotage. During the course of their meetings, Castro for the first time raised the issue of restoring relations. Given the acrimony and hostility of the recent past, “how would the U.S. and Cuba go about it,” he asked Donovan. 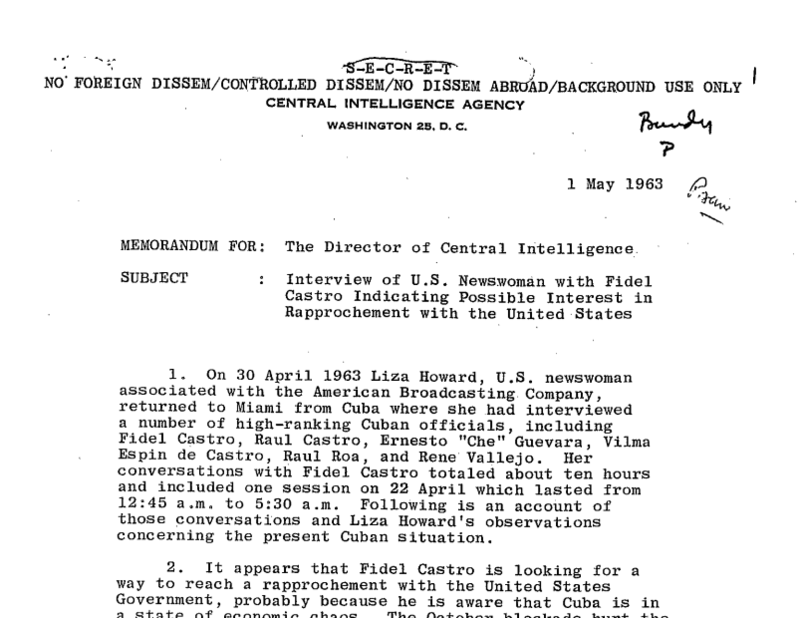 CIA briefing paper, Secret, “Interview of U.S. Newswoman with Fidel Castro Indicating Possible Interest in Rapprochement with the United States,” May 1, 1963. When Donovan’s report on Castro’s interest in talks to normalize relations reached the desk of President Kennedy, the White House began considering the possibility of a “sweet approach” to Castro. Top aides argued that the U.S. should demand that Castro jettison his relations with the Soviets as a pre-condition to any talks. But the President overruled them; he instructed his top aides to “start thinking along more flexible lines” in negotiating with Castro, and made it clear, according to declassified White House documents, that he was “very interested” in pursuing this option. Predictably, the CIA adamantly opposed any dialogue with Cuba. The agency was institutionally invested in its on-going efforts to covertly roll back the revolution. In a secret memo rushed to the White House on May 1, 1963, CIA Director John McCone requested that “no active steps be taken on the rapprochement matter at this time” and urged only the “most limited Washington discussions” on accommodation with Castro. But in the fall of 1963, Washington and Havana did take active steps toward actual negotiations. In September Howard used a cocktail party at her E. 74th st. Manhattan townhouse as cover for the first meeting between a Cuban official, UN Ambassador Carlos Lechuga, and a U.S. official, deputy UN Ambassador William Attwood. Attwood told Lechuga that there was interest at the White House in secret talks, if there was something to talk about. He also noted that “the CIA runs Cuba policy.” Following that meeting, Castro and Kennedy used Howard as an intermediary to began passing messages about arranging an actual negotiation session between the two nations. On November 5, Kennedy’s secret taping system in the Oval Office recorded in a conversation with his national security advisor, McGeorge Bundy, on whether to send William Attwood, who was serving as a deputy to U.S. Ambassador Adlai Stevenson at the United Nations, to Havana to meet secretly with Castro. Attwood, Bundy told the President, “now has an invitation to go down and talk to Fidel about terms and conditions in which he would be interested in a change of relations with the U.S.” The president is heard agreeing to the idea but asking if “we can get Attwood off the payroll before he goes” so as to “sanitize” him as a private citizen in case word of the secret meeting leaked. Amidst the ongoing controversies over conspiracy theories, what is lost in the historical discussion of the assassination is that John F. Kennedy’s very last act as president was to reach out to Castro and offer the possibility of a different bilateral relationship between Havana and Washington. Fifty years later, the potential Kennedy envisioned for co-existence between the Cuban revolution and the U.S. has yet to be realized. As part of commemorating his legacy, his vision for a détente in the Caribbean must be remembered, reconsidered, and revisited. Peter Kornbluh directs the Cuba Documentation Project at the National Security Archive in Washington D.C., and is co-author, with William LeoGrande of the forthcoming book, Talking With Cuba: The Hidden History of Diplomacy between the United States and Cuba. Fascinating article. How do you reconcile it with the claim by Brian Latell that an effort to assassinate Castro was being negotiated (unknowingly with a Castro double agent) on the day Kennedy went to Dallas? He discussed it at the Oct. 2012 JFK Library conference. BERLIN, Germany (Reuters) – A new documentary slated to run on German TV this Friday uncovers new evidence that Lee Harvey Oswald murdered President Kennedy on behalf of the regime of Cuban dictator Fidel Castro. The film also claims that the KGB recommended Oswald to Havana as the man for the job. The documentary to air later this week on German public television provides what its producers believe is the strongest evidence yet linking the regime of Fidel Castro to the assassination of John F. Kennedy. It also provides a motive – sources in the film claim that Cuban intelligence agents contracted Lee Harvey Oswald, a willing drifter, to kill the president in retaliation for several foiled assassination attempts plotted by JFK’s brother, then-attorney general Robert Kennedy, against Castro. “For me, the essence of the assassination has been explained”, German filmmaker Wilfried Huismann said after a preview in Berlin on Wednesday of his new documentary on Kennedy’s murder, “Rendezvous With Death”. His movie may not be the alpha and the omega of JFK scholarship, he says, but at least he can grasp the “political context” of Kennedy’s sudden death. Award-winning filmmaker Huismann relies on newly declassified documents from the Mexican government as well as interviews with aging, colorful insiders from the Cuban intelligence service, G2, the FBI and a veteran American statesman. Why don’t you have where you can post this article on facebook? Lee Harvey Oswald was blamed for killing President Kennedy, and Dallas Police Officer JD Tippit a couple miles away around forty minutes later, despite photos show him at the doorway of the Texas School Book﻿ Depository, when the shots were fired in﻿ the﻿ first instance, and when the three tramps were marched by hours later. The area behind the picket fence left screen of the Moorman photo, shows the Martin Luther Kings and Afro Secret Serviceman Abraham Bolden, spectators as E Howard Hunt and others fire on the President! The﻿ “Badgeman” enhancement of the Moorman shot showing the corner of the rotunda wall, has Dallas Cop Joe Smith firing, in company with Gordon﻿ H Arnold, Andy Warhol and deaf mute Ed Hoffman & his wife. Consider this: Obama is now softening our approach to Iran much to the chagrin of the intelligence forces ( CIA, NSA, and Israel). They could be targeting him now! I remember my father meeting with Lechuga and talking about it at home. He also took a trip to Cuba to see Castro with my mother in 1963, and again in 1976. Fidel considered them personal friends. wouldn’t have touched that with a 10 (or a 100 ) foot-pole!! !…how deep did Slawson/Griffin (?) go, if at all, regarding this short-lived “communication”? Any documents available showing reactions by CIA and DOD officials, and /or of reactions of “in-the field” active agents & assets, especially any and all JM/Wave & Momgoose operatives, regarding this (wrongly assumed by JFK & RFK !) secret communication, which was not unlike Nixon’s ‘secret communications”, move & opening with Red China in late 1971 and into 1972.